Issue – After upgrading from Windows 7 to Windows 10 Groove Music fails to list any music despite being correctly pointed at the default Music location where my 10,529 songs and 1,401 artists reside. I let Grove Music sit overnight thinking maybe it’s as bad or worse than Windows Media Player? 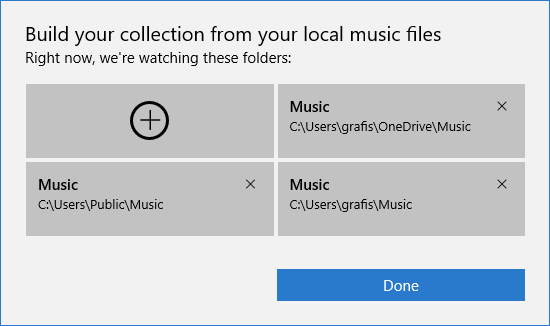 I then gave up – Perhaps Grove Music music is still in beta since it was introduced so late in the Win 10 project? Solution – Re-enable Homegroups. Why? Because apparently when my Windows 10 upgrade disabled Homegroups it also denied application access to my Music library in C:\Users\*username*\Music. How did I discover this when I could freely browse the file and folders of my Music Library? Apple Forums. I searched for the iTunes error string because Groove Music wasn’t giving any errors and my Event logs weren’t reporting any errors. iTunes was my only clue and my search landed on this thread – The folder “iTunes” is on a locked disk….